Our BIG Garden Experiment For This Year! How Simple Can We Grow? If you have followed us for any amount of time now, you know that we love to try new things in the garden. And now that we finally live at the farm, we are not about to stop that tradition this year! A little part of me wonders why we are trying this year’s big experiment. But then again, it makes perfect sense! We’ll get to that in a moment. Ever since we began gardening, our garden has really been one great big experiment. First with the raised rows, then cover crops. Then planting through cover crops for a completely no-till, no work garden. And of course other trials like the stake-a cages, growing potatoes in crates, and more. With each new trial, we were simply searching for a way to simplify. To grow our food organically, with less maintenance, less hassle, and more fun. When we first created our rows in 2011 – we used what we had on hand to cover our walking rows. That was straw and leaves. They worked fairly well in keeping weeds out of our rows, but the straw was a bit pricey, and we wanted to try something that was a bit more permanent and less expensive. So we trialed bark shavings that were an inexpensive by-product of a nearby sawmill. They have worked unbelievably well. In fact, so well that this is where I say I somewhat wonder why we are trying something new at all. But even though the wood chip bark has worked great for us, we would get email after email from readers asking for other inexpensive ways. Not everyone has access to cheap wood chips, straw, or leaves. In fact, there are also a lot of people who have trouble finding even compost materials for their compost pile. And then the light bulb went off! 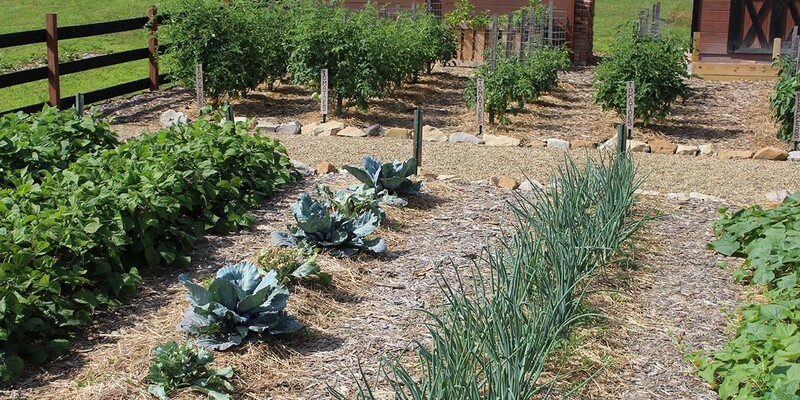 What if we used cover crops in the growing rows to keep out weeds – AND provide great compost material all summer long. Last year, for the entire garden, we actually kept our cover crops in the rows and never turned over the soil. The result? one of our best gardens ever without any work of turning the soil over. 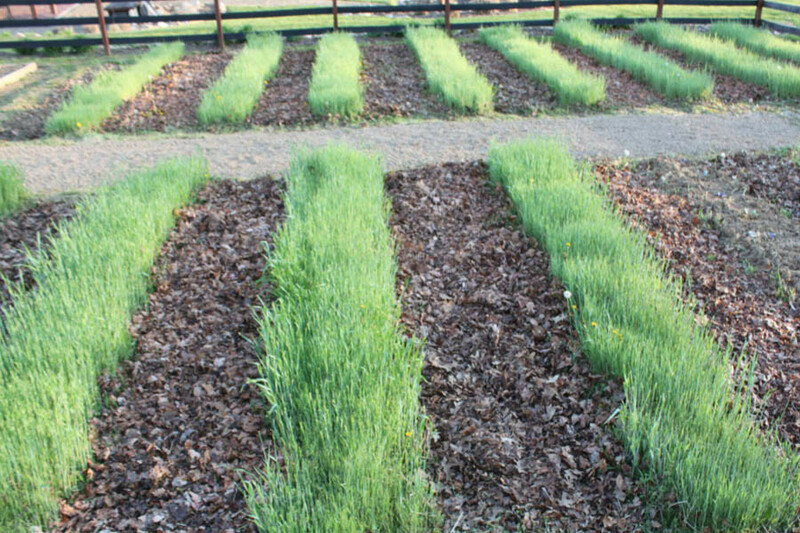 During that process, we mowed off the strips of the cover crops all spring, using the bagged contents to throw into our compost pile. It was the brightest, greenest, most fertile shredded clippings we could have added, and I am positive it really helped our compost pile do even better. So…what if we just simply planted some of our walking rows in a cover crop like annual rye. I mean the bark chips work incredibly well. They really do, But they do cost a little bit, and we do have to replace them a bit every few years. Now you get the most low maintenance, organic solution of all! First off, it’s dirt cheap – pardon the pun! And there benefits only get better from there. As the annual crop grows, we can can use our bagging push mower to mow the walking rows easily. We can then dump those clippings continually into our compost bins all summer long. After all, the middle of summer and late spring, it can be hard to find enough materials. This is the perfect solution. 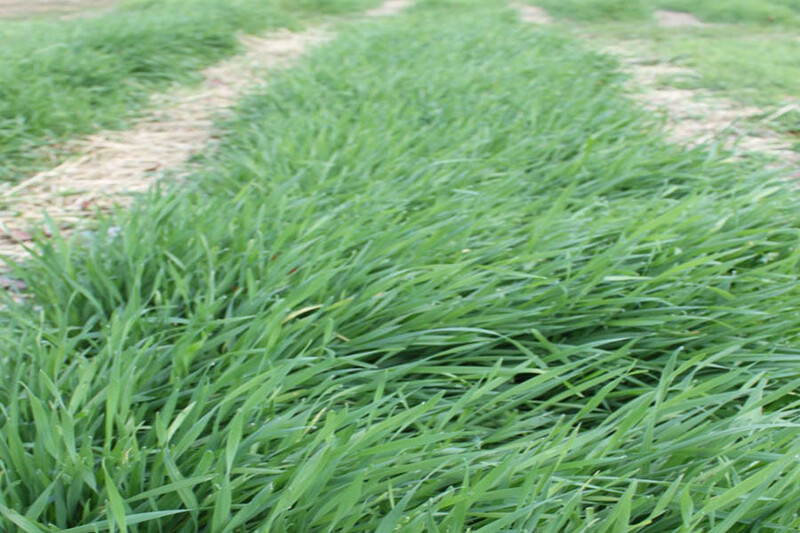 The thick, lush covering of annual rye will snuff out any weeds in the rows, and be easy to walk on when it rains. And those bright green walking rows should look more like the fairways of a lush golf course. It’s a cycle that should easily be able to repeated every spring without ever having to till a thing. I guess we will see if it works. 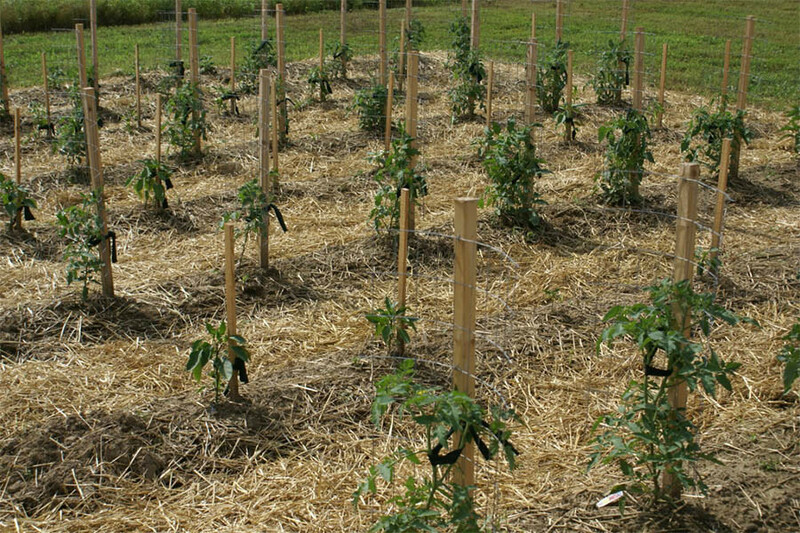 Who knows, maybe in a few years you will see photos of our garden with all green walking rows and no bark mulch. We will be sure to let you know how it works. Who knows, maybe we can make this an even lower cost, lower maintenance garden. And I am sure we will still try to do something new! 🙂 After all, that is the thrill of gardening – you just never know! Happy Gardening– Jim and Mary! We hope you enjoyed this week’s gardening article! If you would like to receive our DIY, Gardening and Recipe articles each week, you can sign up to follow the blog via email in the right hand column above, “Like” us on Facebook, or follow us on Twitter. This article may contain affiliate links. I am trying the raised garden beds this season and I have laid out my garden like you do. I have a 25 x 40 garden so I’m figuring two sides with 10ft rows and 11 18″ rows going the length of the 40ft garden with the 24″ in between. My question is that when I get tomatos they usually become huge and take over my garden, how are you keeping the tomatos, zucchini, and cucumbers to their space???? I think the idea was Annual Winter Rye Grass dyes off with the summer heat. For me I will experiment with a couple walking rows just to get a feel for it in my area…. So, you’re going to cover the growing rows AND the walking rows with annual winter rye? You’re going to mow both till spring planting, then just mow the walking paths but not the growing rows. For the growing rows you’re going to just plant the veggies into the continuing-to-grow rye cover crop like last year? Seems to me there needs to be a border or something then or the rows are going to get wavy, maybe? Then again it might just be me that can’t mow a straight line, lol. But won’t it just look like a lawn that someone threw plants into? Please take a lot of photos! If the rye grass is stiil around come time to plant your garden, till it under….Anything in the walk ways can be mowed like regular lawn and the clippings can be used as compost. Help! I have a raised garden and planted it in rye. We have not gotten a hard freeze this winter so the rye continues to grow beautifully. What do I do when it is time to plant? Do I turn over the soil or try to plant amongst the rye? Enjoyed this article. I, too, have an experiment going every year. There’s always something new to be learned in gardening! I’m also paying closer attention to the health of my soil for a more productive garden. One of those lessons learned in gardening! This sounds great and it will be beautiful. I understand how you want to use it as walkways but How do you plant through the cover crops without having to turn it? I wish you good luck with your experiment! I would have thought the walking rows would be too compact for the seed to germinate thickly enough without tilling. I’ll be curious to hear what happens in coming years. Thanks for publishing your field trials! Have you read any of Elliot Coleman’s books? He plants white dutch clover between the rows of his crops for fertility and weed suppression. It can be mowed also. How will you sow it in the pathways and not get the seed in the growing row? I don’t think that would work here in Texas because the summer heat would kill out the winter rye. Will be interested to see how it works for you.